This Book is Now Also Available for Kindle! Read this on any device using the free Kindle app. The app is available here. Look for the download link. Take it with you everywhere for quick reference. digital version out of site at events. A modern reference book for authentic hand sewing of historical garments and household items. Bound in a period style, soft cover binding and set in period typeface. Appropriate for use and sale at 18th and 19th century events and museum sites. A valuable addition to any sewing kit! Contains basic stitches, seam techniques, thread buttons, button-holes, slit finishing, and an 18th century cross stitch alphabet. 32 pages. 8.5" x 5.5". A second volume of the reference book for authentic hand sewing of historical garments and household items, containing additional stitches and seam techniques, gather attachments, button making, gussets and re-enforcements, cord making with a lucet, and an additional 18th century alphabet for cross stitching. Bound in a period style, soft cover binding and set in period typeface. Appropriate for use and sale at 18th and 19th century events and museum sites. Excellent resource for the advanced hand sewer. 32 pages. 8.5" x 5.5". 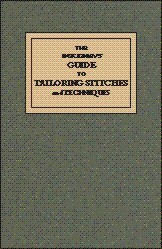 The third in our sewing book series, covers numerous tailoring stitches, seam techniques and great finishing touches! Includes detailed instructions on 18th century style welt and flap pockets, edge stitching, pressing, tools, and other helpful suggestions. A modern reference book for authentic hand sewing of historical garments. Bound in a period style, soft cover binding and set in period typeface. Appropriate for use and sale at 18th and 19th century events and museum sites. A "must have" addition to your sewing book collection! 32 pages. 8.5" x 5.5"
This newly typeset and meticulously re-drawn publication of the1808 book, contains cutting directions and patterns for clothing for Infants, Three Quarters Clothing, Two Year Olds, Girls about Five Years, some items for Women and Men, and Linen for Lying-in Women -- with clothing for poor infants and One to Two Year Olds. Numerous illustrations in the text, plus twenty-seven plates with pattern figures (some complete patterns, and some neckline/armhole/shoulder curves, etc.) printed in half scale of the original fold-out plates. Includes a new Preface, editorial notes and illustrations. 80 pages, soft cover. 11" x 8.5". Now sold only as a set with the tissue supplement. All twenty-seven plates of pattern figures from the book, printed in full scale on sewing pattern tissue! No need to enlarge the scaled plates in the book - just cut and use the figures! Note: No directions are included. The above book is required to use these pattern figures! but is offered separately here. Teaching the various manners of staining wood, ivory, bone, horn, alabaster, marble, and other stones of various colours. Also includes staining of parchment for fine artists' use! An excerpt from The Handmaid to the Arts, Vol. I, printed in London in 1764, with a new glossary. Bound in a period style, soft cover binding. Set in period typeface. An unsurpassable resource for hornsmiths, bonesmiths, cabinetmakers, scrimshanders, jewelers, makers of musical instruments, and other artisans. Also a valuable reference for documentation of stain on original pieces. 28 pages.